The adrenal glands produce catecholamines (both hormones and neurotransmitters) in situations of stress such as psychological stress or low blood sugar levels. Dopamine is one of the primary catecholamines. It is essential for the normal functioning of the central nervous system and is associated with attention, learning, movement, balance, and mood regulation. More specifically, dopamine is a signaling substance in brain circuits that are crucial in creating positive mood states. Dopamine is involved in transmitting signals of reward and motivation and in helping muscles move smoothly. It is synthesized in the brain from the amino acid tyrosine, which is hydroxylated to L-DOPA (3,4 dihydroxy-L-phenylalanine), and is then decarboxylated to dopamine. L-DOPA, dopamine’s immediate precursor, crosses the blood brain barrier while dopamine does not. Regulating dopamine is vital to our physical and mental health. 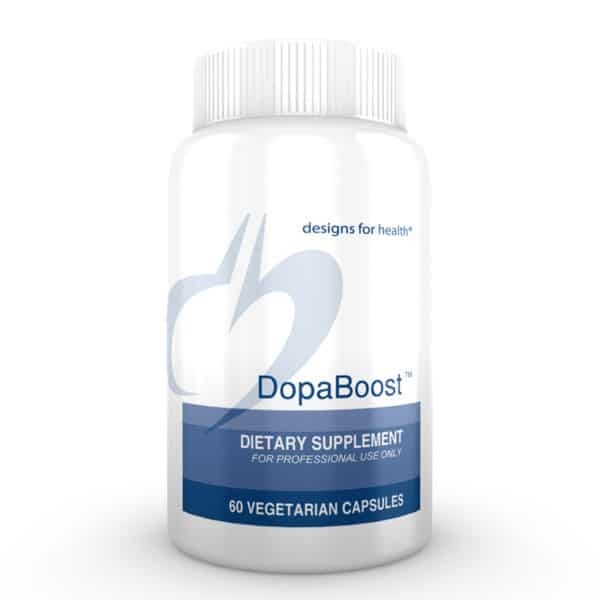 DopaBoost™ was designed to increase the body’s natural production of dopamine. This may be necessary in the clinical support of degenerative neurological disorders related to dopamine activity. These disorders include Parkinson’s disease and dopa-responsive dystonia (DRD), a neurological disorder that usually begins in childhood and whose symptoms are often characterized by problems with movement and a progressive difficulty in walking. Parkinson’s disease affects more than one million Americans each year, a figure expected to rise due to aging populations. The main characteristic feature of Parkinson’s disease is the progressive destruction of dopamine-producing cells in the substantia nigra region of the brain stem (where dopamine is made). The loss of dopamine production affects the balance between dopamine and acetylcholine in the brain, which then causes messages to the muscles to become faulty. Parkinson’s disease symptoms develop once 70% of the dopaminergic neurons in the substantia nigra have been destroyed. This leads to the muscle rigidity and tremors associated with this disease. Neurodegeneration in Parkinson’s disease appears to be multifactorial, where a complex set of reactions lead to the destruction of neurons. 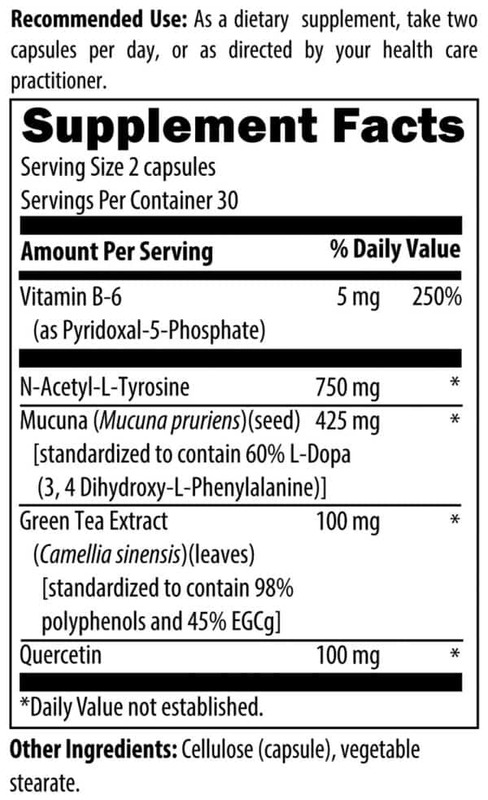 Macuna pruriens is a botanical which naturally contains L-DOPA, the metabolic precursor to dopamine. The Macuna material in DopaBoost™ is standardized to contain an extremely potent 60% L-DOPA. N-acetyl-L-tyrosine is the acetylated derivative of l-tyrosine (the amino acid from which dopamine is synthesized). Acetylation helps to increase the stability and solubility of tyrosine, making it more efficient and bioavailable, and therefore, the superior choice for raising the body’s levels of tyrosine. Pyridoxal-5-phosphate (P5P), which is vitamin B6 in its metabolically active form, is needed for the decarboxylation of L-DOPA to dopamine, as it is a coenzyme for dopa decarboxylase. EGCg (epigallocatechin-3-gallate), the main antioxidant and iron chelator polyphenol in green tea, works in multiple ways to enhance the efficacy of DopaBoost™. EGCg has a positive effect on the electrical activity of dopaminergic neurons (in the substantia nigra). It increases the neuronal activity via inhibition of calcium-dependent potassium currents. Increasing neuronal activity increases the release of dopamine. Research on animal parkinsonism suggests that EGCg restores neuronal loss. Excess iron ions in the brain play a role in the development of neurodegenerative diseases such as Parkinson’s, Alzheimer’s and Huntington’s diseases, and amyotrophic lateral sclerosis (ALS). Iron in an unstable form increases reactive oxygen species (ROS) and hydrogen peroxide (H2O2). This triggers a cascade of events leading to apoptotic cell death in neurodegenerative disorders. Research shows that EGCg, along with the plant flavonoid quercetin, neutralizes radical scavengers and prevents their known neurotoxic effects (ROS scavengers). EGCg elevates the activity of two major oxygen-radical metabolizing enzymes, superoxide dismutase and catalase. Quercetin is also a strong protector of nerve cells against free radical damage. In addition, EGCg and quercetin chelate unbound iron (Fe+) and copper ions (Cu+) out of the body. Recommended Use: Take two capsules per day, or as directed by your health care practitioner.